It is easy to get caught up in the excitement of the game, a child scoring a goal, a team winning a game. Occasionally, it can be easy for that excitement to go too far. The original F.A. RESPECT program was an initiative put in place in 2008 by the Football Association in England to provide guidelines to help protect youth referees from unnecessary abuse. Far too many young referees have quit the game far too early due to the intense pressure put on them by players and coaches and it reached a critical point in England where 1 in 3 grassroots youth games did not have a referee due to a severe shortage of willing and qualified officials. A youth player on the field will have the support of their teammates, their coaches, their parents and friends. If a player makes a mistake, they will regularly receive words of encouragement, and support to keep going. A youth referee is at times, on the field alone. If they make a mistake, they often do not have the same support to encourage them, and may even be criticized and taunted. Both young players and young referees will all make mistakes, but we must all be conscious to provide a positive environment where both can learn and improve from their mistakes. 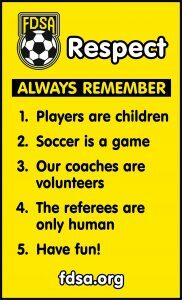 At the FDSA, we strive to develop both top quality players as well as top quality referees. We have adapted RESPECT within our club to help keep our young referees involved in the game so they can gain the needed experience to reach their highest potential without added pressure. RESPECT makes for better enjoyment of the game by all, and helps create an environment where ALL players and members want to be, where they are excited, engaged, improving and able to become their best. The following guides provide best practices and behaviour to ensure everyone gets the most enjoyment out of the game.